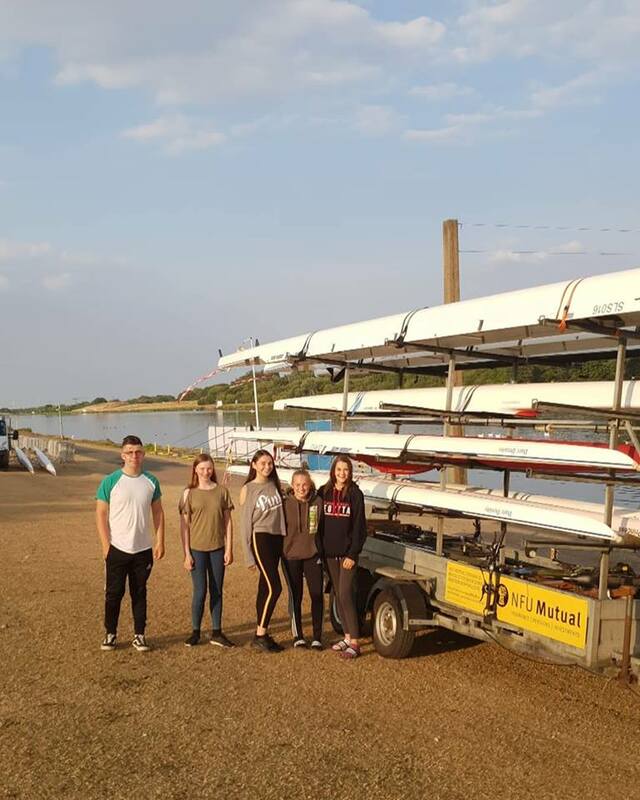 Durham ARC’s Juniors squad had a successful weekend at Nottingham’s National Watersports Centre for the 2018 British Rowing Junior Championships on July 20th to 22nd. The club entered for the omnium in the girls J14 single sculls and in the J14 girls coxed quad on Friday, and in the J16 and J18 boys’ single sculls on Saturday as well as in a composite crew with Tyne ARC in the J15 girls’ coxed quad. Overall 1379 junior rowers from clubs across the UK took part over the three days, starting with 167 singles and 107 doubles in an omnium competition for J14 scullers on Friday, with skills exercises including hands off at the catch, 360 degree spin, standing rigger dips, sequencing, roll ups and back down stop, before finishing with a race over 500 metres. Saturday and Sunday were reserved for time trials, semi-finals and finals for the J15 to J18 competitors. The best performance from DARC came from Adam Morris (above) who clinched 7th position in Saturday’s time trial with a time of 5.50.6 for the 1500 metres to go into Sunday’s semi-finals of the J16 single sculls. With an excellent scull Adam completed the 2km semi-final in 8.17.8, holding off his opponent from George Watson’s College to take second place and secure a place in the A final in which he went on to finish 6th overall. The J14 girls coxed quad of Georgia Abbott, Ruby Coe, Niamh Lang and Amy Slater, coxed by Libby Morris, finished 28th out of 36 entries in Friday morning’s 1000 metre time trial, qualifying them for the E final. Much of the day was then devoted to the omnium in which each crew member took part individually in a single, before they combined again for the 4x+ finals in which a 2nd place finish in the E final ranked them 26th overall. On Saturday Aidan Crilley finished 37th in the J18 1x time trial but failed to qualify for the finals. Ella Sampson and Madlyn Elmer competed in a DARC/Tyne ARC composite J15 girls’ coxed quad where 18th position in the time trial gave them a place in the C final in which they went on to finish 3rd (15th overall) with a time of 8.29.82 for the 2000 metre course. A complete list of results and an event report can be found on the Junior Championships website. This entry was posted in Racing News, Uncategorized on July 24, 2018 by Colin Lawson. Durham ARC’s Masters entered 8 events at Henley Masters Regatta on July 13th and 14th but returned empty handed despite some close races. The closest came in only the third race on Friday morning when the Women’s Masters C eight (Jacki Patrickson, Ray Dominy, Sarah Rutter, Gabrielle Moore, Kate Sowden, Heather Tosley, Helen Adair, Clare Woodward and cox Nigel van Zwanenberg), was drawn against Putney Town in their heat, but despite drafting in reinforcements from the senior squad the outcome over the 1000 metre course was victory for Putney by a margin of only 2 feet. In the other Friday races the MasE quad lost in their heat against Norwich by 1.75 lengths, the MasF coxed four lost in the semi-final against Grosvenor RC from Chester by 2 lengths and David Muse went down by 2.5 lengths against a Leicester opponent in the heat of the MasB single sculls. On Saturday Kim Forster was beaten by 3 lengths by her Milton Keynes opponent in the semi-final of the Women’s MasC single, while Andy Jaggard, having progressed through the heat of the MasG single sculls against Grosvenor, came up against an old adversary from Poplar in the final and went down by 1.25 lengths. In the very next race Joyce Collett, making her first appearance at Henley, went down by 1 length against strong opposition from Tideway Scullers in the final of the WMasG single. Lastly the MasG double was beaten in the final by 2 lengths by Dart Totnes. The full list of results can be found on the Henley Masters website. This entry was posted in Racing News, Uncategorized on July 17, 2018 by Colin Lawson.